Please note: this is a very rough translation of Forbes’ original article which was published in the magazine’s Travel supplement this week. The priority was set by the magazine who asked the translator to remain as close to the original content and style of the writer as possible. This resulted in occasionally having to sacrifice the fluidity of the English text. Also please note that the article was aimed at a Hungarian audience – some way of questioning, e.g. about money and private life may seem odd to a foreign reader but is, in fact, quite OK in Hungarian culture. The translator also offers some background in  brackets on some specific names or facts not necessarily known to foreigners – these were not part of the original text. 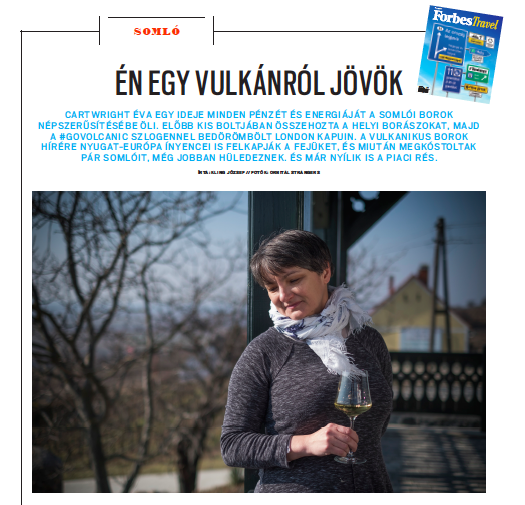 ÉVA CARTWRIGHT HAS BEEN PUTTING ALL OF HER ENERGY AND MONEY INTO PROMOTING SOMLÓ WINES FOR QUITE A WHILE NOW. TO START WITH, SHE BROUGHT TOGETHER THE LOCAL WINEMAKERS IN HER TINY SHOP, THEN, WITH HER #GOVOLCANIC PROJECT SHE WENT ON TO KNOCK ON THE DOORS OF LONDON. VOLCANIC WINES HAVE BEEN RAISING QUITE A BIT OF INTEREST RECENTLY IN WESTERN EUROPE AND CONNOISSEURS WHO TASTE A FEW SOMLÓ [translator: pron:shomlo] WINES OF ARE EVEN MORE INTRIGUED BY THEM.THUS OPENS A GAP IN THE MARKET. THUS OPENS A GAP IN THE MARKET. Somló hill is a witness in two different ways. Firstly, it is called a Witness Mountain; a witness to the volcanic activity that created it during the Pliocene era of Earth and together with it’s fellow witness mountain brothers: Badacsony, St Gyorgy hill, Csobanc, Gulacs, Toti and Halap hills. [translator: ‘witness mountain’ is the literal translation of the Hungarian name for free-standing dormant volcanoes dotted around North-Western Hungary, most also wine-growing areas]. Secondly, Somló is here to testify to the times when Éva, having been born and raised there, now in her late thirties returned to “the mountain” and duly got frustrated about constantly finding wine cellar doors closed. How is it, she wondered, that to ship an oil rig from Alaska to Kazakhstan is easier than to visit two different winemakers in Somló on the same day? A question all the more fitting as Éva had a very successful career in the logistics industry for quite a while, she had been one of the leading experts in customs in her country, no less! She built her guesthouses and wine shop on Somló from her savings and with the help of her former partner. And with this she opened her cellar-door wide, behind which stood all of the wine bottles of Somló hill, ready to be taken home. She opened Somló Wine Shop, sometimes known as the “Half Way” shop, (as it is located exactly half way on the main tourist hiking route leading uphill). The shop finally made all of Somló’s wines accessible to everybody. This was in 2012 and whatever the shop yielded, Éva reinvested. The venture has not yet made any profits, however, last year was her first year without losses. And with this she opened her cellar-door wide, behind which stood all of the wine bottles of Somló hill, ready to be taken home. Éva has really done a lot to shake up the Somló appellation. Her shop became a unique creative workshop, where growers congregate regularly and taste each others’ wines, even those who have not spoken to each other for decades sit together. It was with them that she developed and has since been running the ‘Midsummer Night’ wine festival, attracting a large number of wine lovers to the hill. Whereas in the past Éva organised large Somló wine tastings in Budapest’s Hotel Gellert, with wines from her own stock she can no longer afford to do so, the winegrowers have to supply their own stock for such an event. They come when it shines. The “half way” shop is closed from January through March, the hill is hibernating in these months. Even if you manage to book their heated guesthouse frequently people can not drive up all the way to the shop as the road is very steep and slippery with frost. In April guests only come when the sun is shining. Éva is grateful to Kreinbacher Estate for building their huge winery with a visitor centre, hotel and restaurant at the foot of the hill, their guests eventually find Somló Wine Shop too. The shop itself is self-reliant now and is run by an employee, coincidentally also called Éva. During the summer months and on weekends student workers also chip in to help out. When Éva felt that her shop was on the right track she raised the bar somewhat and sought out a new and bigger challenge. She moved back to the UK full-time to try to find an international market for volcanic wines. ‘Back’ because when she first moved there in 1993 she got married there, since divorced, but kept her former husband’s name, hence the surname Cartwright. From August 2015 Éva has been working on her international wine merchant project using London as her main base. Her ‘one (wo)man’ commercial venture is called Witness Mountain Ltd, with #govolcanic as its brand identifier. Éva was already convinced about volcanic wines as her next calling when John Szabo was still writing his book on the subject: “Volcanic Wines – Salt, Grit and Power”. The concept of volcanic wines became more widely known by Mr Szabo during the time that Éva was the first to come up with the idea and from there converted this niche into a running business. Éva researched the market for over a year, she paid Masters of Wines to taste, position and benchmark the wines. During this year many wines were rejected and out of the many, only a few made it into the final portfolio. In other words, Éva did not just randomly throw her idea onto the market, she wanted to do it in a way that nobody had done it before her, that is to say, according to the English market and not just from an English language point of view. She hired a UK branding agency to help her with the visual appearance as well as with the written and tasked them to communicate her main message. “Sell my wine in England to the English people” was their brief. She handed over pre-written contents to the agency only be to surprised by them as they carved full pages into a couple of sentences. During the two decades she spent in and worked within the UK, Éva had ample time to learn about the vast differences between the Hungarian and English ways of thinking. This was exactly the reason she hired a UK agency, to make sure that all communicative errors, usually due to cultural differences were eliminated. One of the main tasks of the agency was therefore to “Anglicise” the sales process. Finally, they were soo successful in doing so that the result surprised even Éva herself. We think that by teaching people about our culture we will be successful in selling our wines to them. To top it all, we are overly emotional and we tend to speak a lot more than needed. WITH ONE SPIT YOU CAN HIT THREE MICHELIN STARRED RESTAURANT IN LONDON. The feedback is positive. Éva is at the right place at the right time, she noticed a gap in the market. The average UK consumer has grown and started to inquire what is out there in the world beyond Pinot Gris and Merlot. In an everyday UK restaurant, you usually had either a Chardonnay or a Pinot Gris for white and for red, probably Malbec or a Merlot. This era is ending now, those who did not pay more than five pounds for a bottle before are now seeking out the ten to fifteen-pound range, especially in the wealthier London. What is behind this shift? Éva reasons that the work of the likes of Jamie Oliver and Gordon Ramsay is now bearing fruit. The people have long been content with their local Chinese or Indian food and drink, but now are wealthier and want to live better. For restaurants, it is an opportunity to stand out with a unique wine list. According to Éva, the task is therefore to get her wines as close to these wine lists as possible. To achieve this requires the perseverance of a door-to-door salesman and to get an appointment at a prestigious restaurant is very difficult. It takes at least a month to reach the one person who will finally say ‘OK, you can bring your wine in tomorrow at 11 am for a tasting’. Given that, so far all but one place at which Éva succeeded to get an appointment decided to list Éva’s wines. It was only the Lanesborough so far, a luxury Hotel in one of London’s most expensive areas, Knightsbridge, where they did not so far list her wines. A recent huge success was to get listings in two Michelin-starred French-style restaurants, ‘Pied-á-Terre’ and ‘L’Autre Pied’. As Éva tells the story, she had 3 ‘black-belt’ French sommeliers sitting across her at the table, animatedly speaking in French during the tasting and with her only understanding a few French Grand Cru names when coming to the Somló – wines. She had five of these and a Zsirai Tokaj Aszu listed by them the next day. And what was wrong with the others she took? They were “more international” and the three Frenchmen were out for something truly special. A very reassuring feedback for Somló and also for Éva, who has so far put 39 thousand GBP(15 million HUF) of her own money into this project. We can truly say that she gave all she had; she sold one of her Somló guesthouses, her car, sacrificed her savings and her share dividends that she receives in Hungary. The branding only cost her around 10k. Costs are increased by her living in London, where she pays 1,800 GBP (720,000 HUF) per month for a flat which she also uses as an office and as well as a wine- ‘warehouse’, as Eva tends to have an average 400 bottles ‘on her’ at any one time. Still, she is fully convinced that [with volcanic wines] we have a once in a century opportunity to define a new global brand from scratch. All we need to do is to get on this train that is accelerating now, right in front of our eyes. The writer is the Chief Editor of GUSTO magazine.